My child is on the honor roll at Smith Elementary. I brake for yard sales. 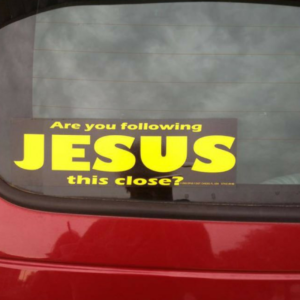 Bumper Stickers. People use them to make a statement to the world including people they know and the strangers who are lucky enough to get stuck behind them in traffic. We use them to brag about our children, tell others what political party or sports team we support and how many miles we have walked or ran competitively. These bumper stickers are looked at as sort of our badge of honor. Things we are proud of or places we have traveled. Bumper Stickers can now be customized to create the exact message we wish to portray. If we had to all have one bumper sticker to describe who we are or what we stand for, what would your bumper sticker say? I think I would have one like “Heaven or Bust”. What about you? This entry was posted in devotional, inspirational, motivational, spiritual on June 16, 2018 by Deanna Young.